McDonalds store can get involved. 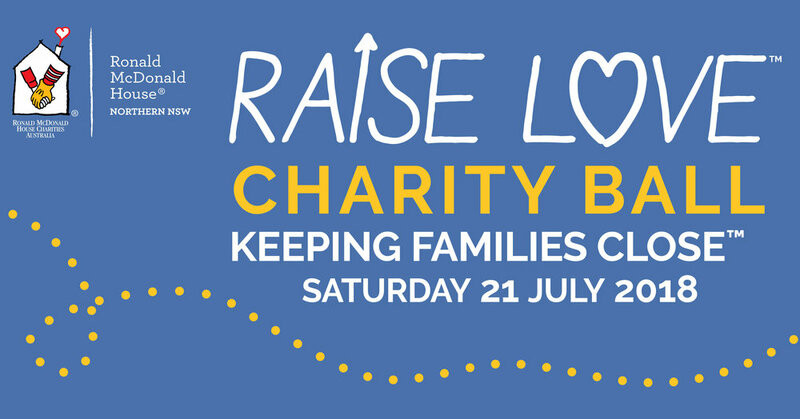 Ronald McDonald House, Northern NSW Raise Love Charity Ball will be held at NEX in Newcastle and will be a fun night celebrating keeping families close. If you're interested in a table, please email donnah@rmhnnsw.org.au. We are also seeking volunteers to help on the night, if you are interested email jodym@rmhnnsw.org.au for details. Queens Wharf Hotel will be hosting an event on Saturday 15 September where you can come down and join in the fun. Balance Collective Mayfield will be holding an event on Saturday 22 September where you can get involved as a team or individual in their energetic and family friendly Spin day. Register at your local Balance Collective or contact donnah@rmhnnsw.org.au for more information. Ronald McDonald House, Tamworth is celebrating it's 10 year anniversary. Come along and join Ronald McDonald in the Community Open Day celebrations. Join us for the Raw Challenge - a mud obstacle course with 55+ obstacles over a 7km in Doyalson. Join as a team or individual, challenge yourself and your friends in this fun event for all ages and fitness levels. Registration details coming soon.